July 28, 2017 in BOOKS / MAGAZINES. November 8, 2016 in COMICS / GRAPHIC NOVELS. 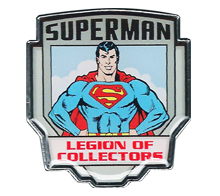 Here is a Superman children’s belt and buckle produced in 1981 by LEE. The belt is elastic and printed with artwork of Superman flying through the clouds. The speech balloons say: “It’s a bird!” “It’s a plane!” “It’s SUPERMAN!” The buckle is made of brass and has an enameled ‘S’ symbol on its face. October 13, 2016 in CLOTHING / COSTUMES. December 23, 2015 in COMICS / GRAPHIC NOVELS. August 29, 2015 in COMICS / GRAPHIC NOVELS.